The things you should know before entering a Retirement Village. Living in a retirement village is popular and the market is growing, it has the capacity to be a good lifestyle decision but also the capacity to be a poor financial decision. There are many variations to the arrangements to enter a Retirement Village, the principles discussed here may not match all of them. It is easy to identify benefits as they are laid out in the glossy promotional material but the costs, the 'real' costs can be a little more difficult. This site has a focus on areas that are generally not discussed in the operator promotional material or the consumer advice material. What is the real cost where the 'deferred management fee' is calculated on the exit price rather than the entry price. What is the real cost where there is no 'capital gain' provision in the contract. What is the real cost of living in a Retirement village as opposed to a standard Residential Tenancy. 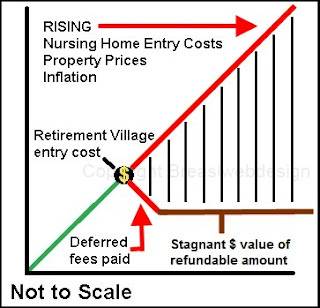 The graphic above indicates how the 'deferred fee', inflation, rising property prices and rising nursing home entry costs can devalue your refundable $ amount. When the nice salesperson says "Don't worry about the deferred fee, it is paid on exit and something your children will deal with" do not accept that statement without further research. The impact of the deferred fee, loss of earnings, inflation etc. is something many will have to deal with. A change in circumstances without further financial resources could leave a person in a financial position they did not envisage at the outset. It is important to anticipate what the financial position might be in say 5, 10, 15 years. Additional capital resources may be needed to meet the cost of any change in circumstances – eg: choose or need to leave the village, re-enter the property market, meet the cost of a nursing home bond.